I've talked about Mu Daiko before, so I'll keep this brief. 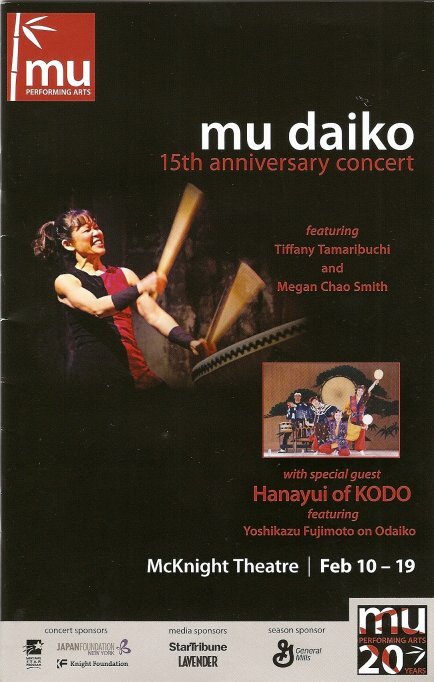 Mu Daiko is Mu Peforming Arts' taiko drumming ensemble, led by Artistic Director Iris Shiraishi, and they're celebrating their 15th anniversary with a series of concerts at the Ordway's McKnight Theatre. I attended last night's performance, and it was, as always, thrilling. I don't know enough about the art form to really speak intelligently about it or differentiate songs - some are soft and gentle, but most are fast and loud. Drum sizes and placements vary, and sometimes there is guitar or voice accompaniment (local actors Katie Bradley and Sheena Janson). Megan Chao Smith as the featured performer is amazing (and she gets to wear a sparkly top). Next weekend's concerts will also feature Hanayui, an ensemble from Japan. I'm sure they're great too, but I was happy to attend on an all Mu Daiko night. Energy, Drive, Power, Passion, Playfulness, Joy, Grace, Beauty, Collaboration, Rhythm, Precision, Focus. The bottom line is, if you ever get a chance to see Mu Daiko perform, take it. I guarantee you'll have a great time. Not just from listening to the amazingly intricate rhythms and watching the performers dance around their drums, but feeling it in your body right down to your bones. Happy anniversary Mu Daiko! I look forward to more performances, and if I'm brave enough, I might even take a class someday.